DO NOT TRAVEL BY CAR IN INDIA !!! We left at 5.30AM and stop for sleeping only half way trhu at 9PM. I was sooo tyred, headeache, sore trhoe, my eyes were burning from the dust and smog. In this tiny little car. Anyway avoid Bus, or car with driver. 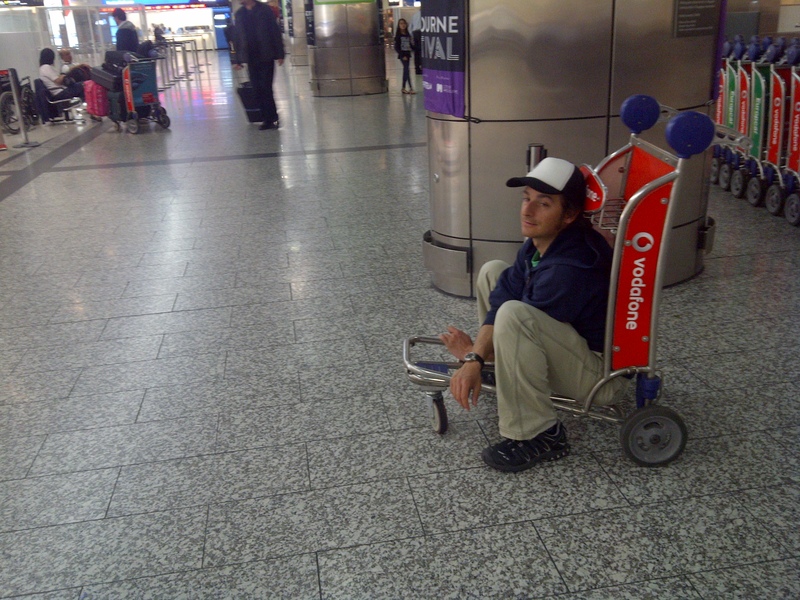 Best and easy option is to fly and then get the 4WD taxi, or if u dont fly u can take the train that takes up to 12 hours. U can book the tiket ant the international traintiket office. Its a bit hard to organize a tiket but eventually after few hours in the office where u fill up forms and wait and all the stuff. Anyway good luck with all your choice. On top of that we stopped on the way to Sikkim at 9pm in a country town, we asked for a room and they sayd no room for international people !?!?!? WTFK i didn’t know if kick him in the balls or laugh…. And i chose for the second one….offcourse:) . But on my way out they called me back again and approved to have a “whiteskin” in theyr hotel. Room bit stinky linen dirty hahaha but it was only for the nite and anyway I always travel with a light sleepingbed. Ooooo yess finally after 2 weeks I’ve got internet and my Blackberry service on so i can update all my movement. Short story from the past days, landed in Chennai, 5 days around there then 3 days in Tiruvannamalai, 3 days in Bangalore, 4 days in Calcutta. And today on the way up to Sikkim. This guy that i have meet on Couchsurfing suggested me this other guy who sometimes is organizing tour up north. So after spending the nite at his house with his all family, we start our trip at 5.30 AM to avoid traffic jam. 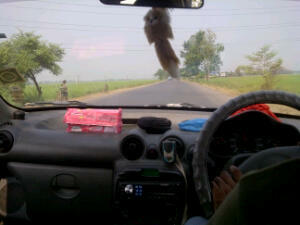 Is a warm sunny stiky day but after 4 days of Calcutta is nice to see some farms and green landscape. 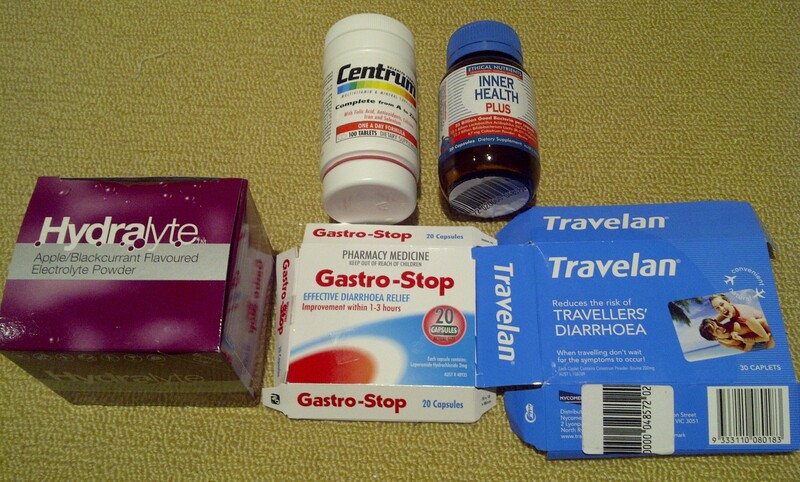 I’m getting ready and organising my bags and stuff to take to my 2 months in India. I will travel from south to north so I will have to take a different range of clothing from hot summer to cold mountain. 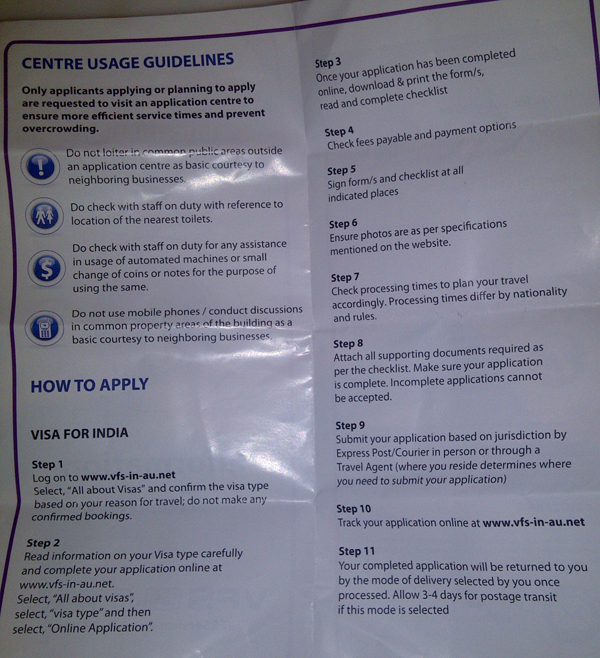 And now we are on the VISA section. I’ve cheked online few sources about Visa etc but then I’ve decided to go to the office who will organize the Visa for you. Here in Melbourne this office is in the city in Swanson street @ Part 4 Suite, Level 12, 55 Swanston Street. So Tuesday 20 Sep. I went to this office to try to do the Visa, wait for 20 minutes my turn, I already knew that i could not apply for the visa because as soon as i get in the office Visa one big sign says ” We accept only Visa applications made via Internet ” … so I decided to do the queue anyway to have some informations. I’ve ask how long it takes to get the visa because we have already booked the fly the for the 29, and the guy asked me what type of passport I have, and because I hold an Italian passport and not from the Commonwealth I have to wait from 10 days to 2 weeks, instead of 5 days like one Australian citizen. Noooooooooooo !!!!!!! First thing i went to the Emirates office just around the corner on Collins st. and changed my fly to the 6th October, that was no problem, they changed my fly in 5 minutes easy, the problem now is AirAsia… no office anywhere, you can contact them only online…. 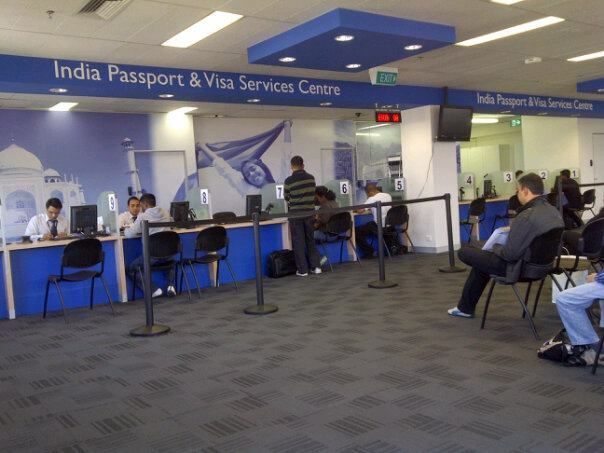 or calling them @ 5$ per minute…..
Back home straight on the Visa website http://www.vfs-in-au.net/ and apply for the Tourist Visa fill up the Form prit it out the result. If you need they have 10 computers and you can use for 5 minutes for free. 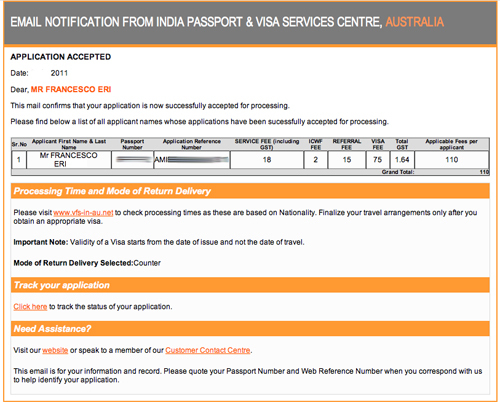 The same nite at 11PM I was checking for some email and ended up checking again for my Visa, but this time the message changed to ” your application and Passport is ready to be collected at our office between 10AM and 3PM, thank you” ….. 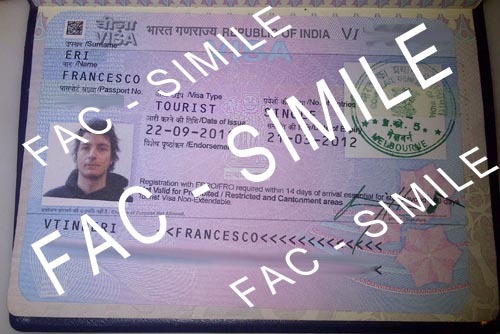 I could not believe that, after 24 hours I have already my Indian Visa!!! The day after i went straight to the office and with my docket i collect my passport with my visa! Runed to the Emirates office and changed my fly back again from the 6th to the 29sept. So happy for my new book as soon as I came up to Mt.Buller I started looking at the different region and places and maps and pictures etc. Yes, it’s India i thoug! Soon i’ve started to look online as well, WikiTravel India, looking for some touristic group on Facebook, etc. A friend of mine suggested me to contact the Indian High Commission in Australia and check their website. I’ve even checked ” dove siamo nel mondo ” (where we are in the world) It’s one italian website from the Italian Foreign Minister where you can log in and write about where you are and where you will go during your travels. Then I’ve checked ” viaggiare sicuri ” (travel safe) another italian website where you can chek all the information about problems natural emergency, wars, all kind of problems… And you even have all the informations about the place where you like to go. A good website to find flights is Skyscanner, tx to that i find all my flights to and from India. Booked my flights, chosen my spot on the fly, checked in, I’m ready to fly… Thursday 29 September at 3.20AM from Melbourne and then from Kualalumpur to Chennai, arriving in India at 6.00PM of the 29th. Then is time to looking for a place to stay and to visit once arrived there so I’ve start contact few people from Chennai thru Couchsurfing. Couchsurfing is one of the best source for travellers you can find on the web, I’m member of CS since 2004 and I’ve uset it allot douring my travels, for find informations from real locals, for a drink, for a couch were i could sleep or for just using the shower 🙂 but always fantastic experiences.